Over the last decennia, corporate organisations have tried to increase their business performance through stretching their employees. This strategy has given rise to views and practices that worked for some people and didn’t for many others. And these practices also gave birth to the popular management buzz like: raise the bar – leverage competencies – bigger, better, faster – advanced growth. It all goes hand in hand with an endless drive for change. It seems another older buzz has completely been forgotten; i.e. the Peter-principle whereby people get over-stretched and over-promoted up to their level of incompetency. Where this has delivered great career opportunities to some, it resulted for many others in burn-out, in severance and in some extreme situations even into suicide. Slowly but steadily, we see progress. “Let’s take her out of her comfort zone” slowly makes place for the view that “the comfort zone” isn’t a bad place to be. Companies start to understand that continuous and speeded-up stretching of their staff isn’t the best strategy for ultimate profit delivery. Also the most ambitious managers start to re-enjoy and to understand the benefits of working for a while in their comfort zone. They experience that the comfort zone is not their enemy. On the contrary, it’s a great place for reflection, for stress reduction, for reloading the batteries and a lever for next steps. 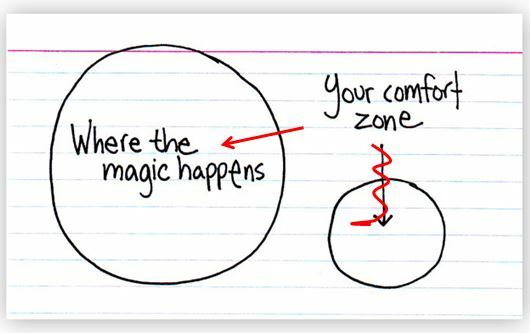 “Stepping out of your comfort zone” is such a big buzz, so big that we forget the real meaning and value of your comfort zone. It’s your body and mind that tells you that this is the place where you feel at ease; the place where we have access to what we are looking for. By recognising that the comfort zone is an acceptable place to be, people –in business as well as in private life- will also experience that this place itself is continuously on the move. You may move a bit slower than when you are pushed out of it or when you are stretched to the limits but it delivers authentic and lower risk growth. And much more sustainable. The internet is full of pictograms indicating that it is outside of your comfort zone where “magic happens”. Some of the managers that I have been coaching had been –violently- pulled out of their comfort zone, but didn’t experience any magic. Frustration, doubt and a lower self-esteem were the results. Getting these people re-engaged with their comfort zone, that is what delivered the magic and the subsequent great opportunities. So for all those fast-paced goal-getters, sit back, relax and breathe normally –yep I know where this comes from- and take a while to enjoy your comfort zone. Add a bit of self-reflection and you’ll land on great new avenues.